Recently, oil prices have taken a nosedive. The price of a barrel of oil is half of what it was only 6 months ago. I have ambivalent feelings about this when I think of the impact at the moment and in the future. I like the lower price of gasoline as much as the next person. Yesterday I topped up my gas tank, which I do when it gets to about half (a good practice in this frozen country). It was only $15 and change! A few short months ago it would have cost me $23 or so! My pocketbook likes that. Does that mean that I can afford to galavant all over the countryside just because it’s cheaper? No, I don’t think so. Why would I want to spew more polluting carbons into the atmosphere? But I’m hoping, I’m REALLY hoping that the lower price of a barrel of oil will impact the production of oil in Canada. Yes, OPEC – 1, Canada -0. In fact, it already has. The giant (mostly foreign owned) oil producers have already cut back, way back on production. The ripple effect is being felt in the entire industry. Unfortunately, those people who work in this oil industry are paying the price with losing their jobs. I feel really sorry about that. I know someone has to “take one for the team” and the “little guy” is it. Something near and dear to my heart is the opposition to the Energy East Pipeline which is proposed to run from the Alberta oil sands across the county, right past my home (a couple kilometers away, and through the river that my home sits beside), to the east coast where it will be shipped overseas. The plummet in the oil prices might be the death knell to the Energy East Pipeline project proposal because it may not be profitable. Yeah! With the cheap price of gasoline in North America now, does that mean that people will buy bigger vehicles (SUVs) and drive like there’s no tomorrow? The sale of SUVs has never been more robust. This is bad news for our environment. With more carbons being spewed into the atmosphere, climate change will proceed more rapidly and we can expect more extreme weather. There’s not much I can do about anything. In fact, I can’t do a single thing about the price of a barrel of oil or Alberta oil or the Energy East pipeline or the increased production of SUVs. I can simply choose to continue to respect our environment, drive my old Honda as little as possible, and use less oil products. It’s true. 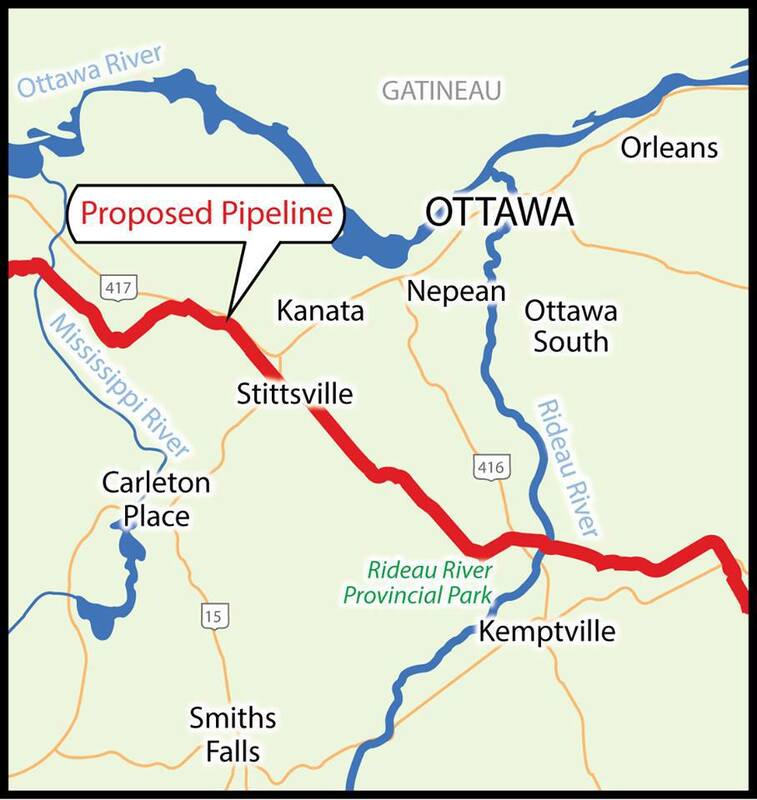 The rumours I heard about a nearby Natural Gas pipeline being converted into an oil pipeline are true – TransCanada Pipeline’s Energy East Project. And I am horrified. This aging pipeline passes under our Rideau River just a few kilometers downstream from my home. Now that the shock has settled in, I’m fighting mad! Just like a mother Grizzly Bear defending her cubs, I feel like I have to do my own little Grammom part to defend my children and grandchildren. I won’t accept this quietly. 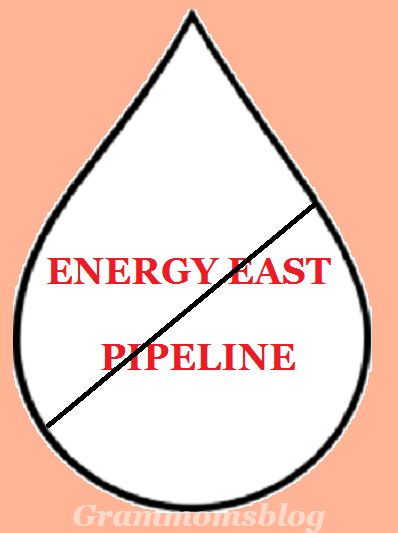 The Energy East proposal is about converting a 50+ year old pipeline that was built to transport Natural Gas to an oil pipeline. The purpose of this conversion is to pump over a MILLION barrels a day of thick (like pudding), toxic, Alberta tar sands bitumen oil through my area to St. John, New Brunswick. This pipeline discreetly passes under farmers fields and beneath the road leading to the nearest town a few kilometers up the road from me – it’s hardly noticeable! It also passes under highway 416 unbeknownst to the thousands of vehicles that drive over it daily. But the biggest, scariest part is that this old pipeline runs across the bottom of the Rideau River through Baxter Conservation Area, a sensitive ecosystem – which just happens to be too close for comfort to me. I could go on and on about the risks of this proposal. 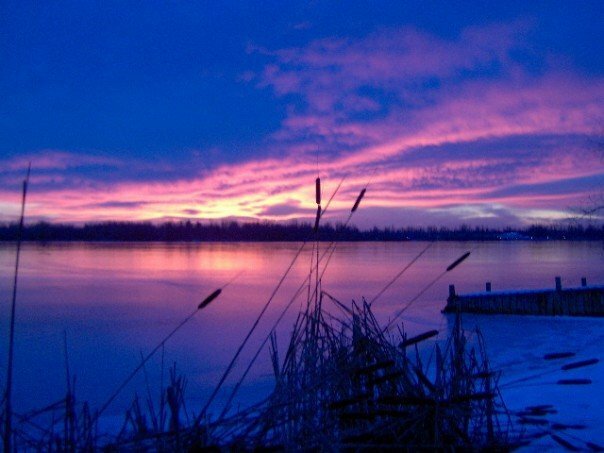 First and foremost, is the very likely risk of a pipeline rupture creating a devastating oil spill either on land, underground, or in the precious river system. Such a spill would kill our river (a UNESCO World Heritage Site) immediately and for future generations. The impact of this cannot be underestimated. It’s a nightmarish daydream to believe that this pipeline will increase our oil security. This oil is slated for shipment to international markets at a premium price not to Canadians as the oil companies have erroneously allowed us to believe. Canadians will end up paying more at the pumps because our oil will command more costly OPEC prices. Shouldn’t we be trying to be more carbon neutral rather that carbon gluttonous? Do the intelligent specimens in the corporate offices understand that their product is a major contributor to climate change? Did the 2013 downtown Calgary flood (where their head offices are located) or the “hundred year” weather-every-ten-years, stimulate their curiosity? Everything is out of whack and this pipeline proposal for more, more, more oil just exacerbates the world’s negative climate change condition. I’m sure you’ve heard of the XL pipeline proposal which was slated to go from Alberta through the United States to the Gulf of Mexico until citizens made it an election issue and the whole deal was postponed. Around that time, Enbridge’s westward Gateway pipeline proposal received opposition from citizens, governments, and native groups in British Columbia, putting that project on hold. 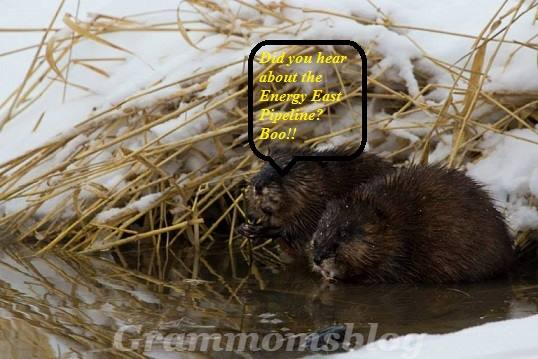 So going east was the only way that TransCanada Pipeline could go now that it is backed into a corner. Company profit is a huge motivator. So the ordinary citizen has been motivated too. One of my favourite sayings is from Margaret Mead: “Never doubt that a small group of thoughtful, committed citizens can change the world; indeed, it’s the only thing that ever has.” Groups and people like me are rallying against the oil pipeline: Ecology Ottawa, Sustainable North Grenville, The Green Party of Canada, and Rideau River Friends Against the Oil Pipeline , to name a few. And we’re just getting started…… There are petitions to sign, rallies to attend, protests to support, etc. Personally, I’ve signed the petitions and plan to attend rallies and local ‘open houses’ hosted by TransCanada Pipeline or Sustainable North Grenville / Ecology Ottawa. In addition, I am making a large 4×8 sign to hang on a tree at my river’s edge which simply says “Stop the Oil Pipeline” inside a large red ‘stop circle’. Thousands and thousands of people use the river during the summer boating season and the winter snowmobiling season. Many of them might not be unaware of the impending disruption to their peaceful lives with this disastrous pipeline proposal. It’s my duty to bring it to their attention. I’ve written my local municipal counsellor to ask him where HE stands on this pipeline proposal…………let’s just say he’s not getting MY vote next election! I plan to write to my provincial and federal elected officials as well and let them know that I will put my next vote where it counts: against the Energy East oil pipeline. There’s a First Time for Everything! grammomsblog on What a Year! Suddenly, he was my everything. Pregnancy, birth and postpartum support. Conscious parenting too! Books • Speaking • Consulting • etc.